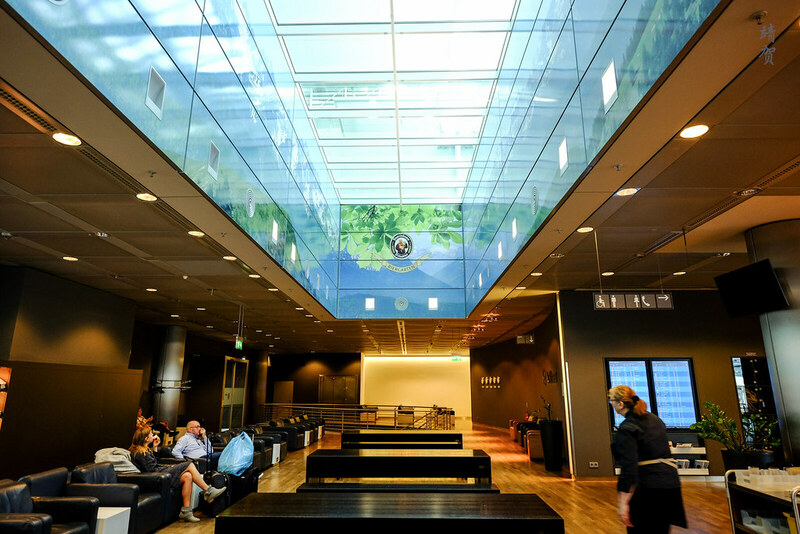 Munich is a large airport by most standards and there are several Lufthansa lounges in the terminal. 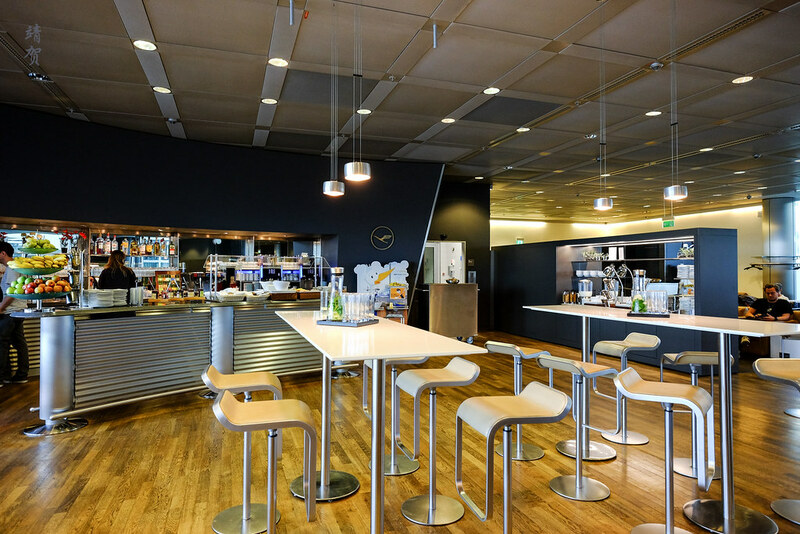 Since our flight was departing from the ‘G’ gates, we had access to the nearest Business class lounge for departures in the Schengen area. After getting our credentials checked at the ground floor reception, we had to take the elevators up one floor and were greeted by an empty TV lounge. Beside it, a row of clocks tell the time zone in several world market cities before a neat row of tables and benches lie under a floodlit atrium. The space above has murals of the Bavarian Alps and together they created a Bavarian beer hall ambience, so that was neat. 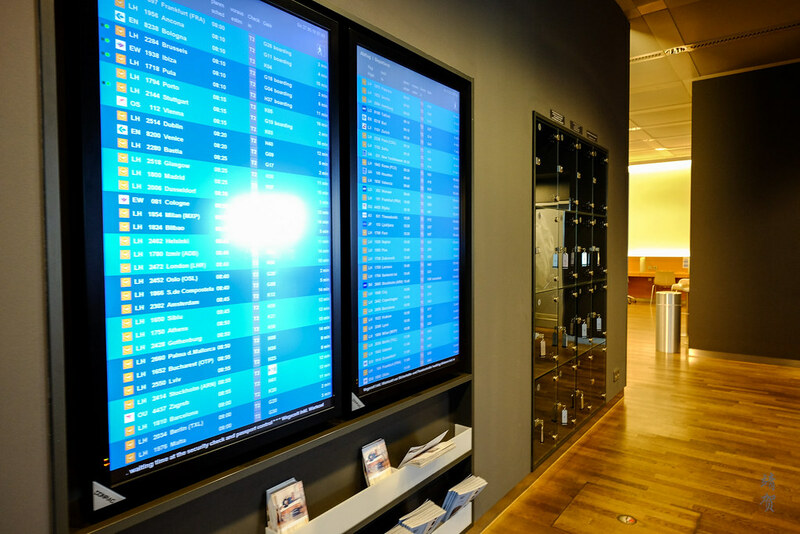 Turning left from the space, there was a set of panels that display all the flight information for departing flights and personal lockers with keys are complimentary for guests to use. 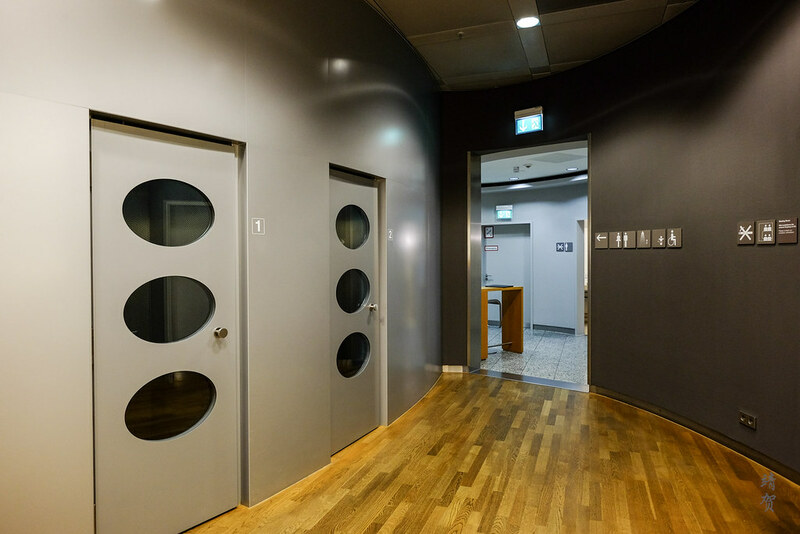 Next to the locker was the entrance to the restroom where there are private shower rooms available. There was also 2 enclosed quiet rooms for guests who wishes to make private telephone calls. 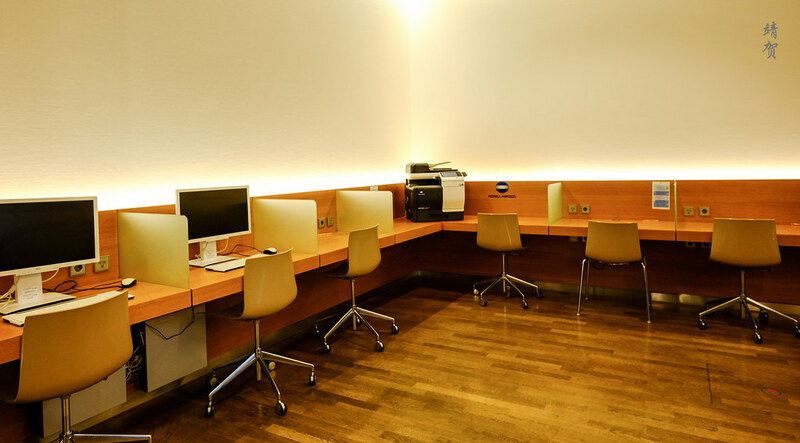 Across from the telephone room/booths, was a row of cubicles which is fitted with power outlets and 2 of them have PCs with a printer in the corner. 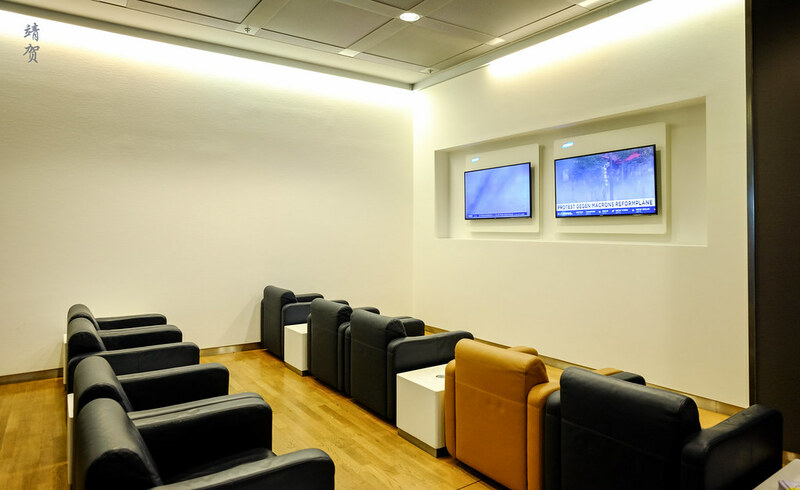 This space allows business travellers to work using their own laptop and print any materials they require. 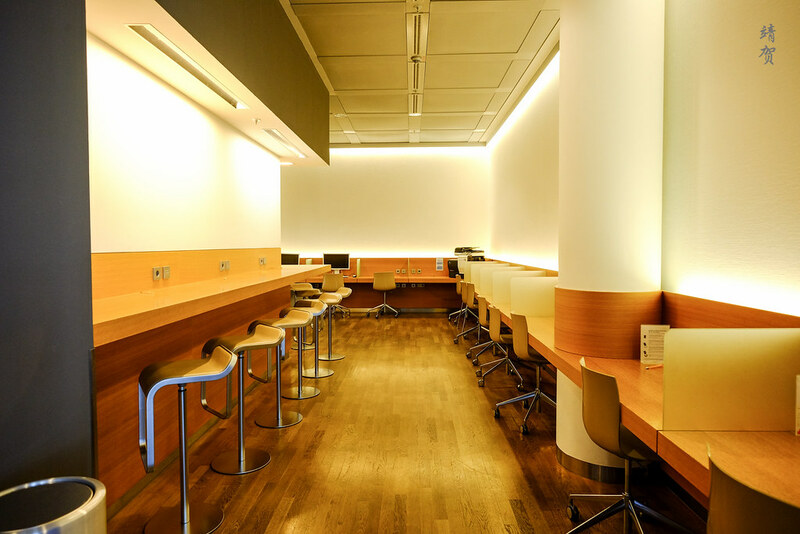 Further inside, there are even more cubicle spaces and more workspaces with bar stools. Shielded by a wall, this space has more privacy and less noise so I dub it as the quiet corner. 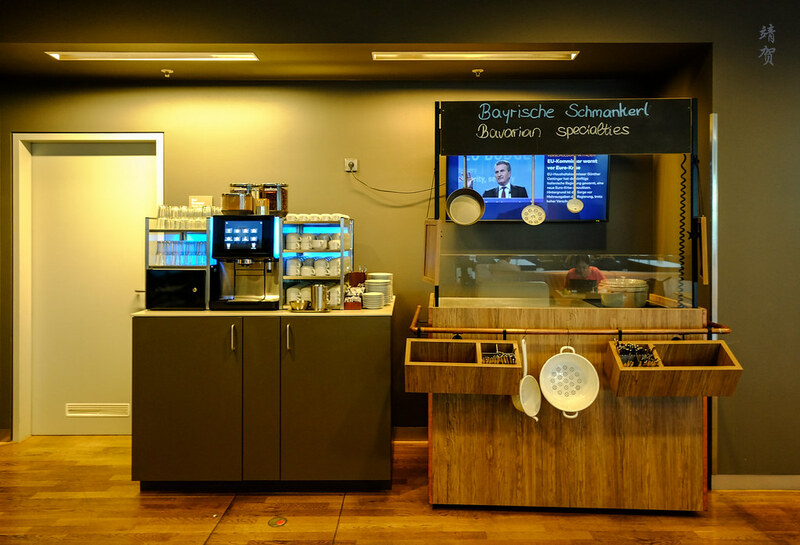 On the opposite side of the wall shielding the business work space was a cabinet with a touch-screen espresso machine and a food stand serving Bavarian specialties. 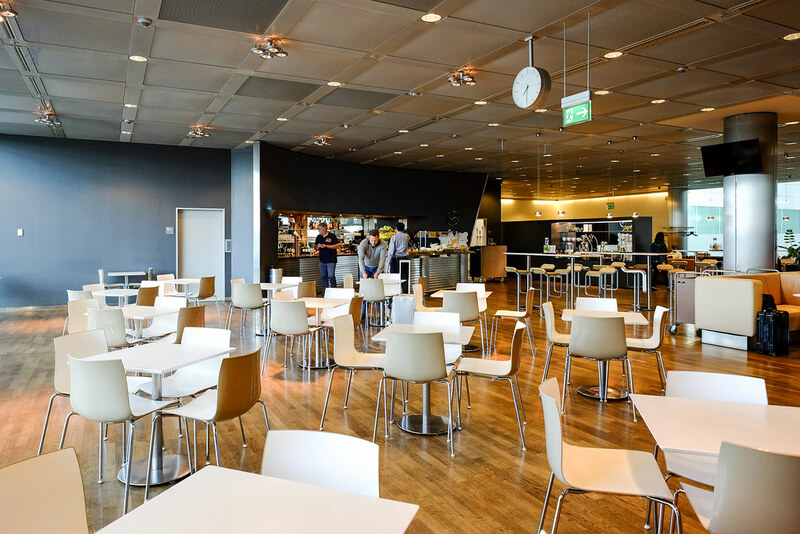 While the espresso machine was operable, the food stand was closed and my guess is they will open it up for lunch and dinner since I was in the lounge a bit earlier around 7:30am. 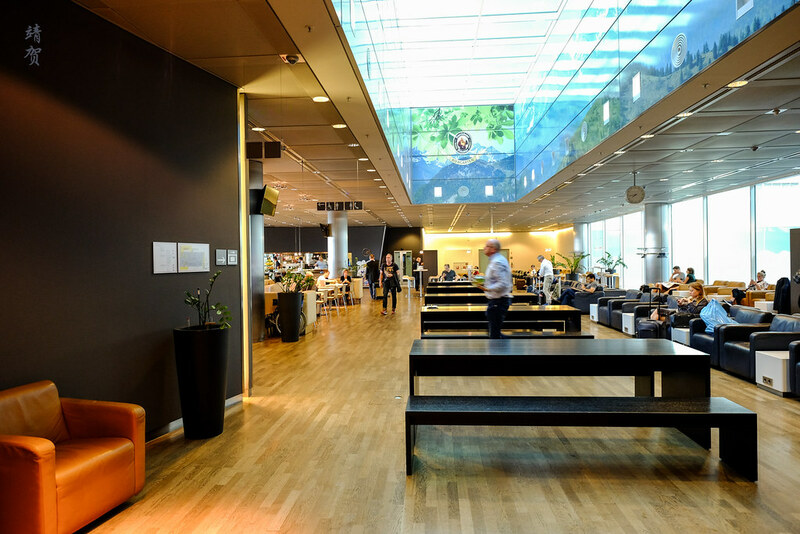 The brightest section of the lounge lies in the central dining area as there was a set of windows overlooking the terminal. There was plenty of tables here in a cafeteria setting. 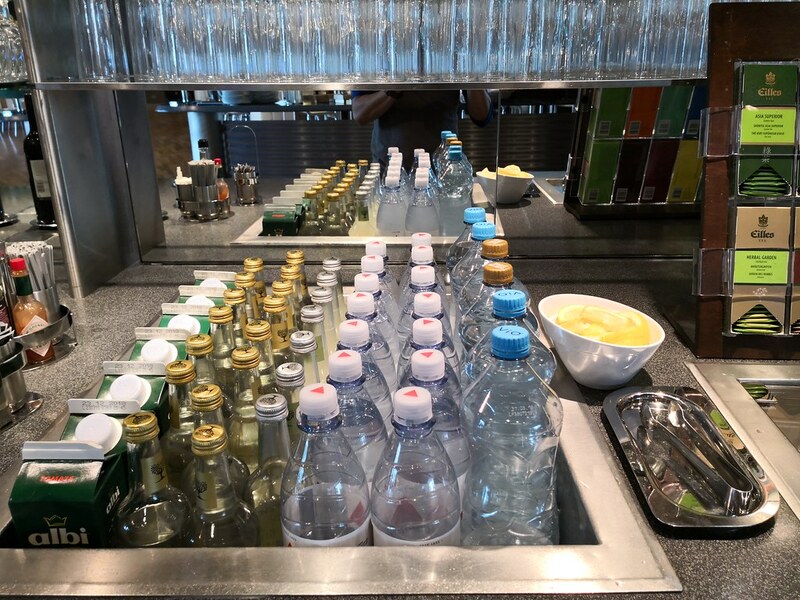 Next to the buffet area, there are tall bar tables and stools for quick bites and these bar tables have their own tray filled with clean glasses and a jar of infused water. The buffet counter itself seems small compared to the size of the lounge. And the food served inside was definitely sub-par after arriving from a Singapore Airlines flight. 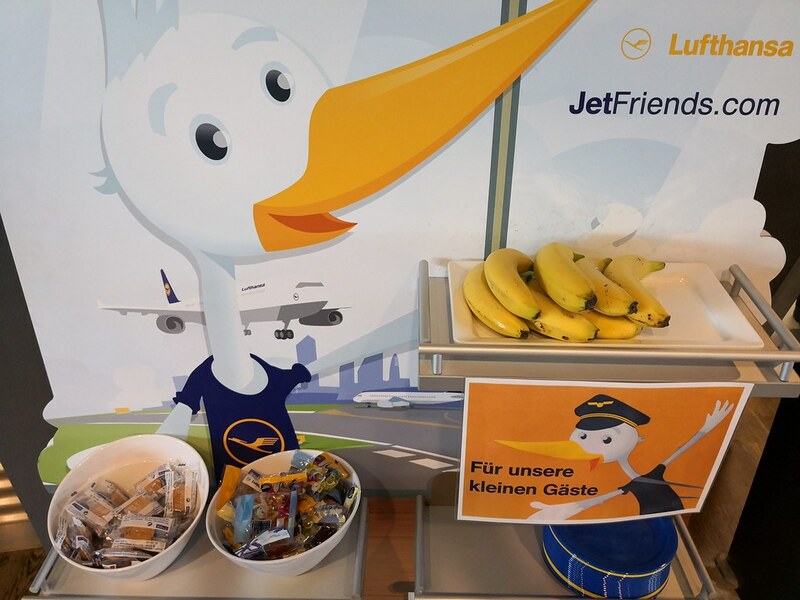 Gummy bar candies are the hallmark of a Lufthansa lounge and they had those on containers alongside mixed nuts snacks. 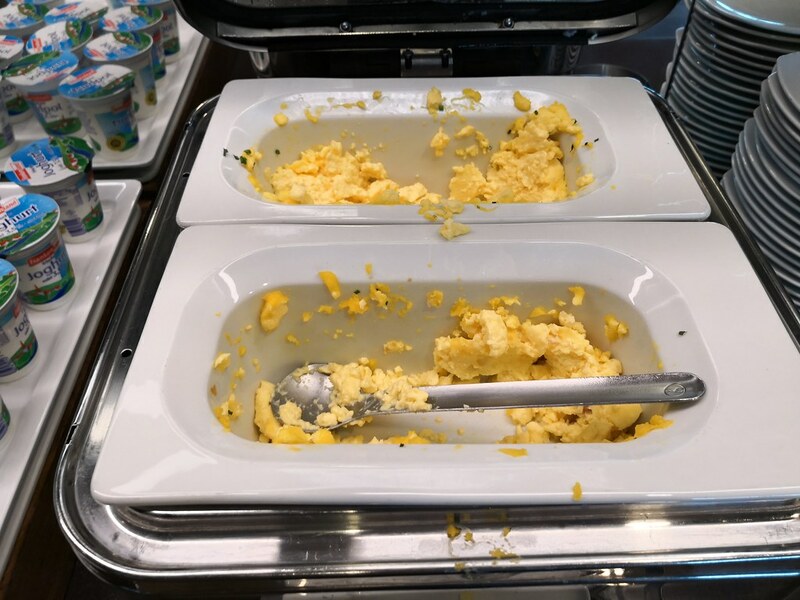 Since it was breakfast time, the food was limited to scrambled or boiled eggs, cheese and cold cuts, with little variety to choose from. 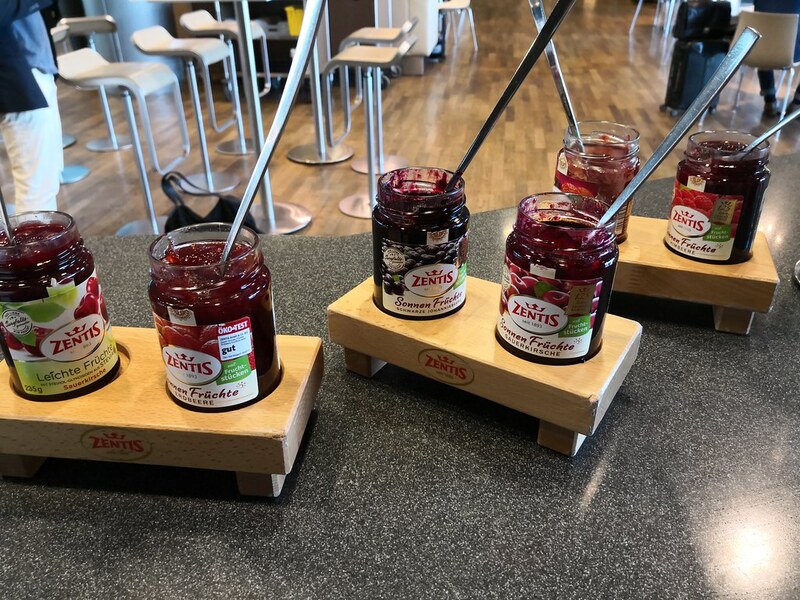 Bread and rolls were offered from the basket and they had a range of berry and fruit jams to choose from for the spreads. 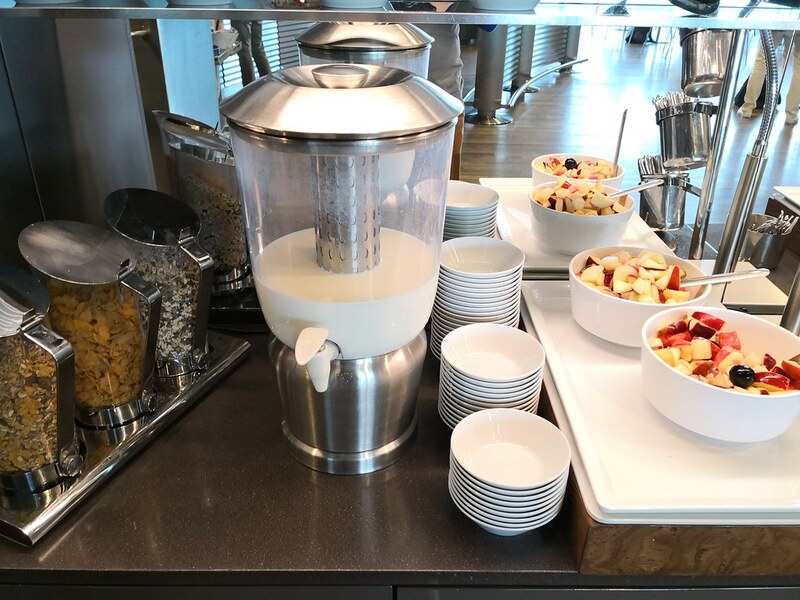 There was milk, cereal and a fruit bowl to make your own continental breakfast. Individually packed yogurts are available as well. On the kid’s corner, there are the usual packet of gummy planes and bananas. There was also a bowl filled with individually packed Ricola candies. Perhaps it is a way for Ricola to introduce new flavours? 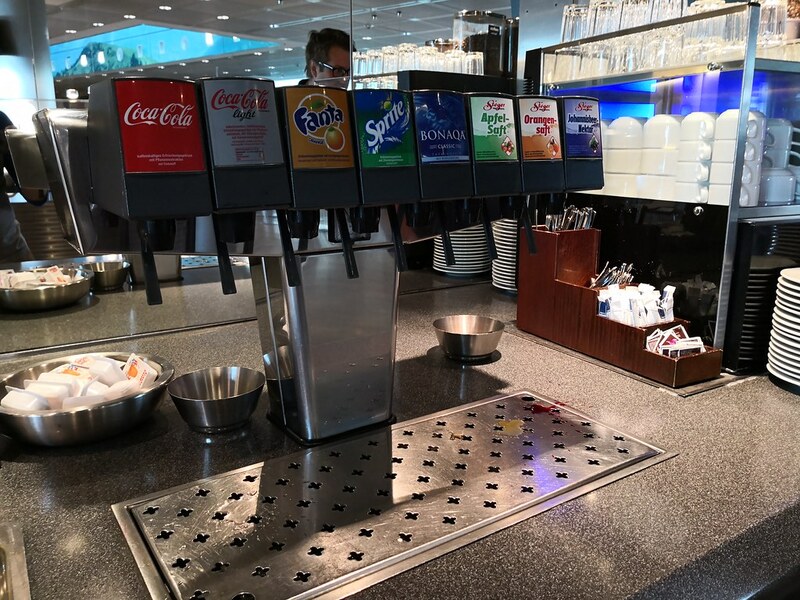 For other beverages, there was a soft drink dispenser in the counter. Other drinks like juices and still or sparkling water are from the bottles and containers. 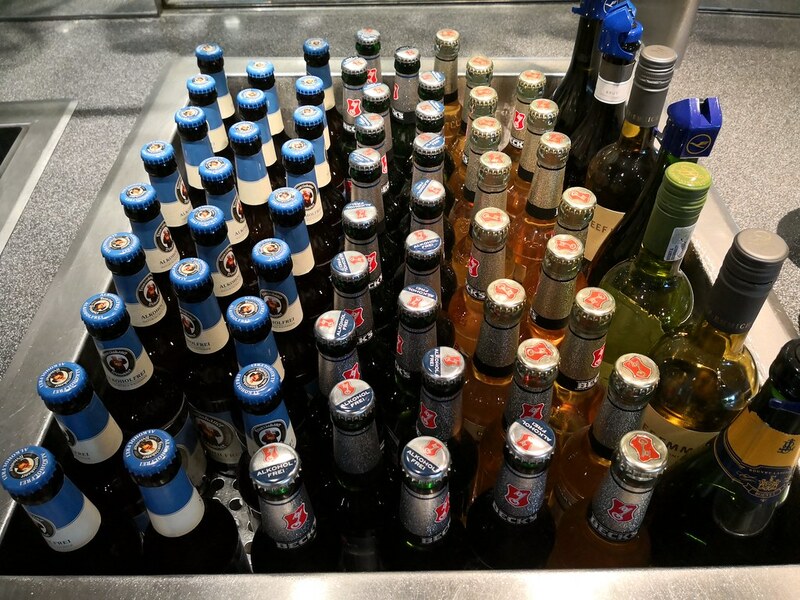 There were both beer and alcohol-free beers along with a variety of wines for those who wants to have a drink in the morning. 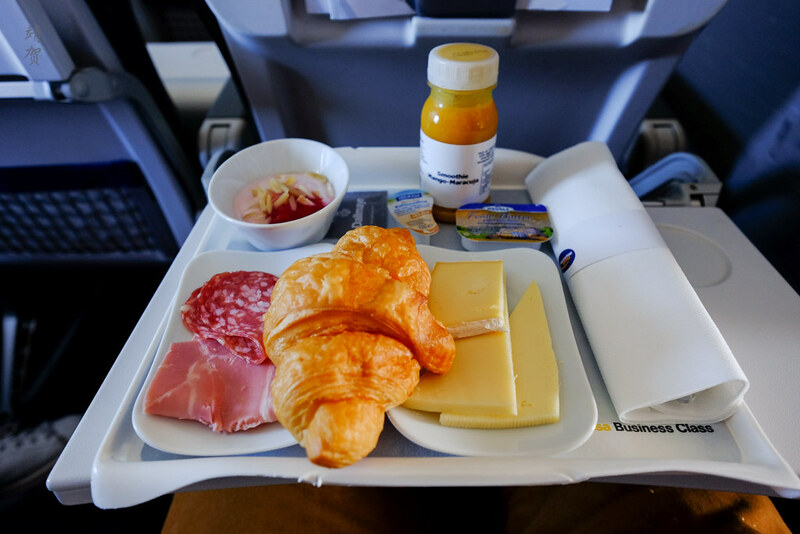 Since the food did not look particularly appetizing and I already had a filling breakfast on my flight, I did not take anything substantial from the buffet. 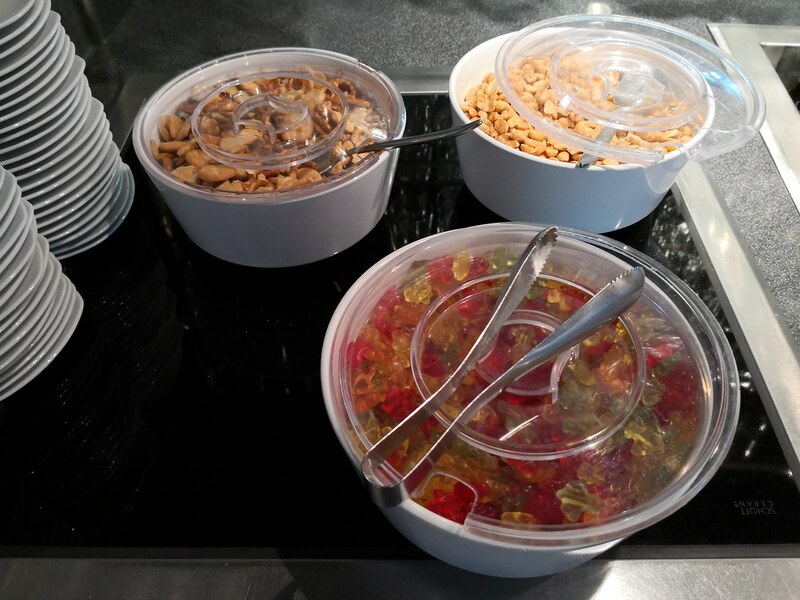 Instead I just had some gummy candies and refreshments before returning to my dining table. 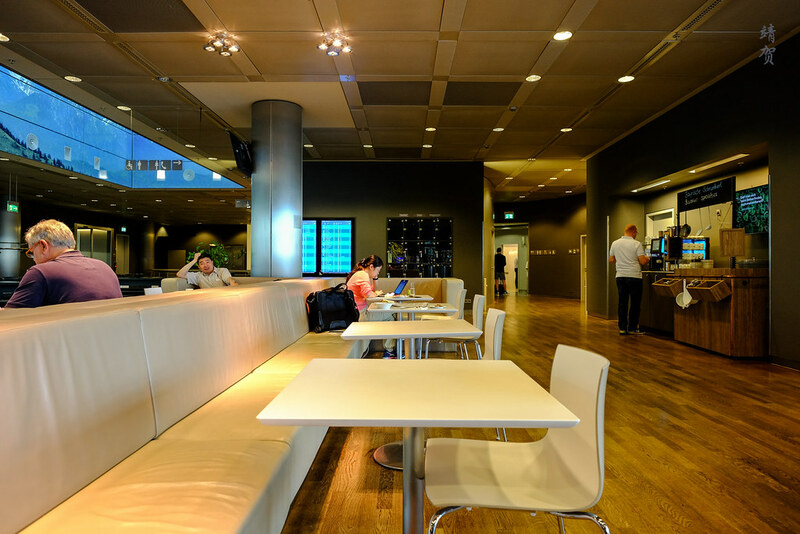 With little crowds in the lounge that morning, I chose to sit down in the more comfortable upholstered benches in the centre of the lounge. 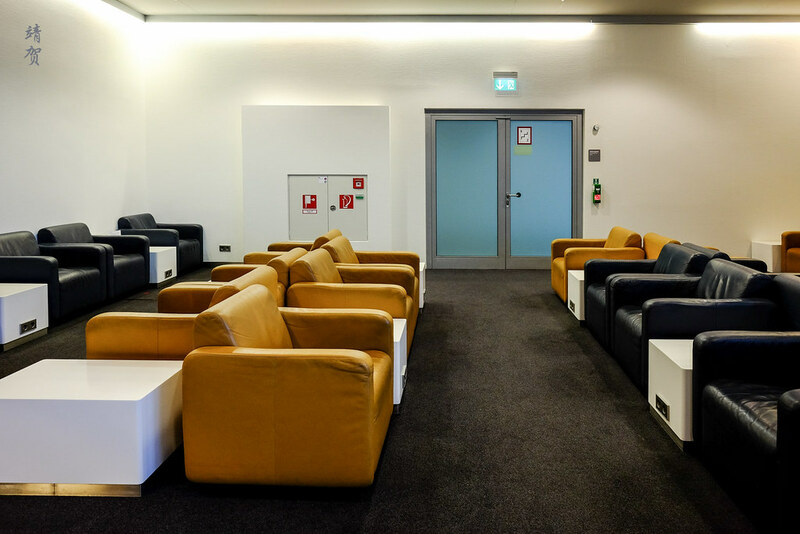 Further back beside the buffet counter, there are more standard lounge seating spaces with the sofas in the traditional drab colours of black and beige with a low counter-table fitted with plugs in between 2 armchairs. As a whole, the lounge is basic at best and I definitely do not recommend hungry guests to eat any fine meal in this lounge. 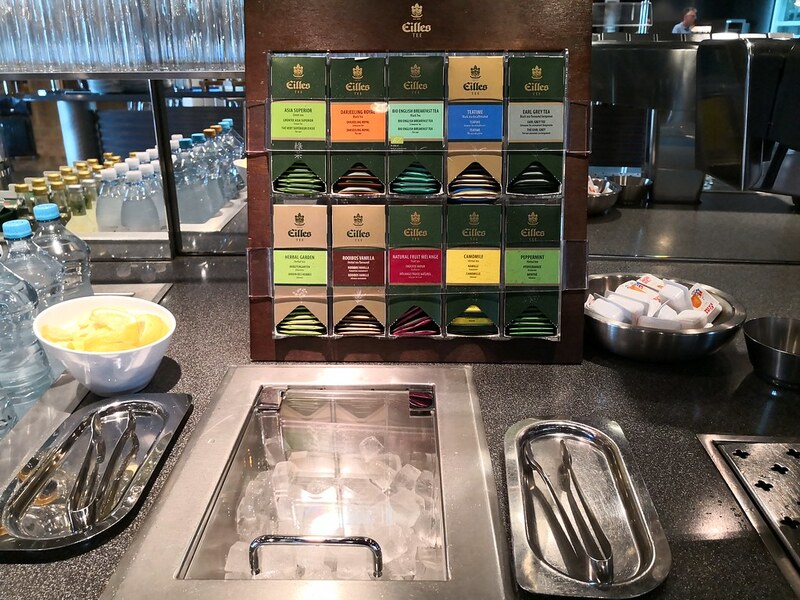 As a Business Class lounge, this was quite disappointing considering Munich is one of Lufthansa’s main hubs. There was definitely space to sit down for a drink, and space to work if needed. 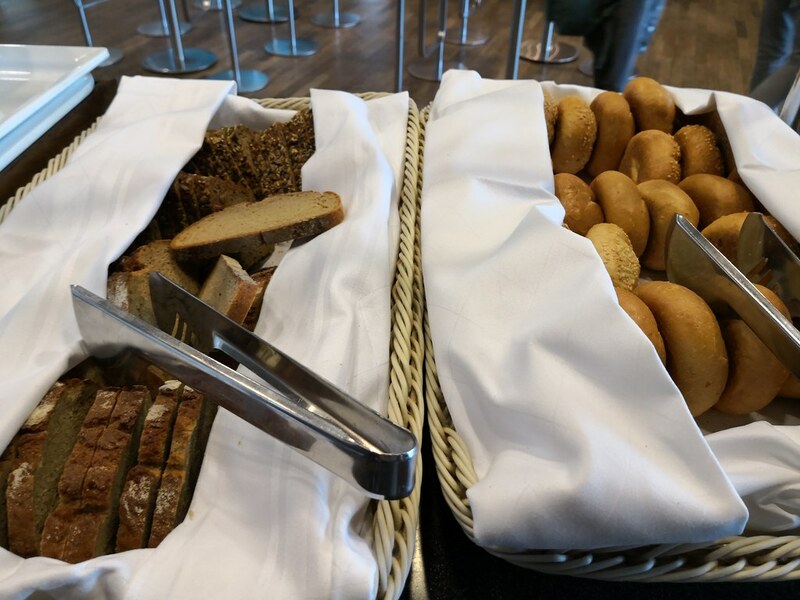 Other than that, the terminal probably offers more in terms of food. 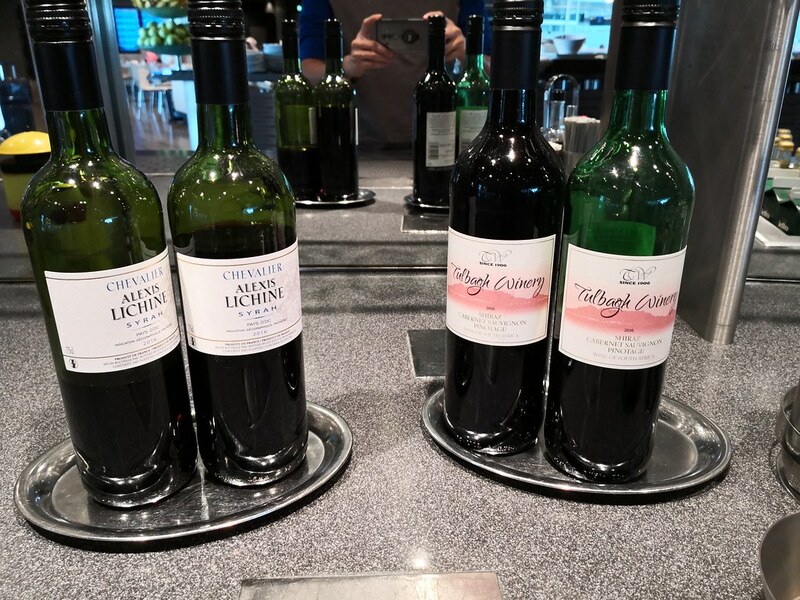 In the end, I actually had a more satisfying meal onboard my next flight to Oslo. 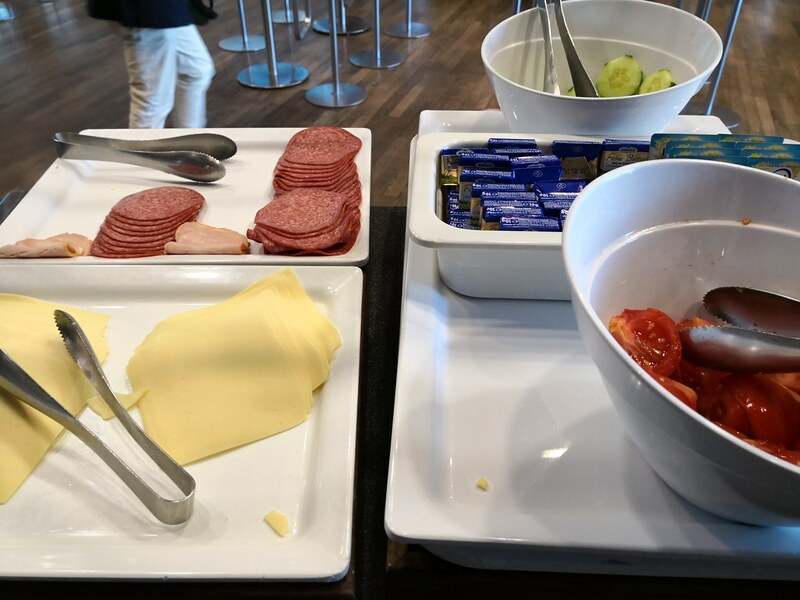 Since I am not going to review the standard intra-Europe Business Class onboard Lufthansa, I will just leave a picture of my breakfast meal service in Business Class since that was the point of differentiation from Economy.